I say it may be worse because dairy cows live their entire lives facing a host of issues, such as being pumped with hormones and antibiotics, living under horrible conditions, and from the psychological abuse they endure; just so we gain something from the cows that we don’t necessarily need. While killing an animal ends its life, it at least stops the immediate pain and suffering that the animal experiences while it is alive and being exploited for what it produces. For a dairy farm to be efficient it needs to continuously produce milk from all of its cows, and like humans, cows only produce milk once they are pregnant. This typically requires that the dairy farmer constantly impregnate the cow (using artificial insemination) so that it can constantly produce milk that it would have given its new born calf, except that the calf shortly after birth is taken away from its mother, and even worse is if the calf is male it is sold and then slaughtered to produce veal. To permanently separate a cow from its calf causes psychological damage to the cow and to the calf. Further once the cow is producing milk, it is given hormones to maintain over production of milk so that the cow can produce enormous amounts of milk than it would be able to naturally. This continuous cycle of gestation and milk production is extremely physically demanding on the cow and causes them pain and much suffering. Further dairy farm cows live much of their lives in close quarters and can contract several diseases, one of these diseases is mastitis, a painful disease that causes the utter of the cow to swell and look like an inflated balloon. 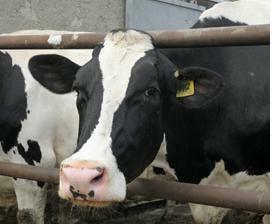 Cows usually catch mastitis by sharing pumps with cows that already have the disease. I believe it is safe to say that dairy cows live in terrible conditions and go through a demanding life where the majority of their time is spent either in labor or pumping milk, and those are just a few of the issues that dairy cows face throughout their lives. With all this being said there are farms that are smaller in size than compared to factory farms, but the vast majority of the milk we drink come from the factory farms, and even the smaller farms are not entirely innocent from causing pain and suffering to these gentle animals. Also I’d like to be clear, the cows used for producing milk, are sent to slaughter houses once they can no longer efficiently produce milk, and thus many times only live to a certain age that is much younger than they would be if they were to live a natural life, which means that these cows will still be killed, but that they endure an extended life of suffering then a beef cow would be. Vegetarians that choose not to eat meat for ethical reasons should consider a vegan lifestyle instead, as the suffering of cows and other animals bred purely for human needs is a life of misery. As for me, I do plan on one day switching to a vegan lifestyle, but I know that it’s easier said than done, but for the sake of the cows and all other animals that are being exploited, I just wouldn’t feel right drinking another glass of milk.